Total rainfall for last week- 12.5mm, so ½ an inch. Not a huge amount, especially in Queensland standards, but the garden is looking better for it. I did water the veggie garden and the trees last night, as it had been dry for a few days, and it started raining. Though it only registered ½ mm in the rain gauge, so still happy I did it- even if it looked silly watering the garden in the rain! This weekend was once again dominated by other events. I was coordinating the marshals for the Tri Clubs corporate Triathlon- our first. It was bigger than we had hoped for and went well. But it took up about 6 hours of Sunday morning. But at least the rain held off. Saturday we went into town (though we didn't ride) we met the social riders for coffee and a catch up, then had a list of errands to do. Followed by restocking of our freezer. We had intended to add a few ducks as well, but we were tired and running out of daylight hours. But the Old English Game roosters had to go. They were a little younger than we had intended culling them, but I fear if we hadn’t, they would have. Well they already had, with the Rhode Island Red x EOG and had begun picking on another. But given the size on their nuts, no wonder they had begun fighting; the testosterone in that pen! On the plus side we have 4 fairly meaty chickens stocked for our visitors. I must admit they were not the biggest or heaviest, but meat to size ratio was very good. But as a ‘meat bird’ we were quite impressed; the meat was very lean, slightly darker than other chicken breed we have raised, but not gamey. I am really hopeful that these characteristics will also pass on from the girls; as they are due to start laying in the next month or so. I had intended to write an instruction blog on how to skin a chicken, but I found it quite hard to hold everything and take pictures. Plus it was becoming increasingly difficult to not get the camera messy. I think I will attempt this again, but by document someone else. 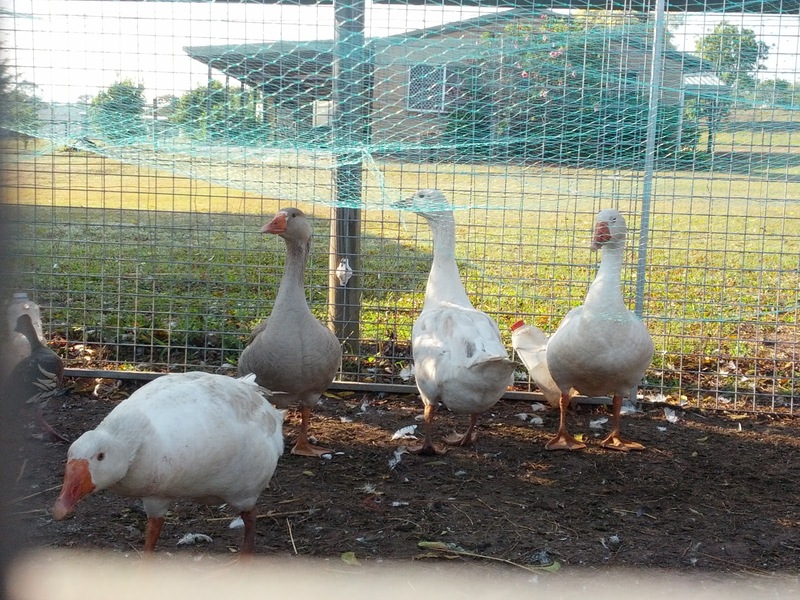 On the subject of ‘meat birds’, we finally swapped our roosters over; giving Ronnie a run with the general flock. And Rocky some time with our remaining Indian Game hen. We know Ronnies’ fertile as we have 9 Indian Game chicks running around out the front and have had quite a few batches of layers from Rocky. But it will be interesting to see if there is any difference in ‘productivity’ or meat quality of one over the other. I suggested the Indian game over the layers should be more ‘productive’ as they lay more. However I have read that there may be difficulties in the males of this breed reaching the hens to breed successfully. On the other hand Indian Game hens are not as productive, but Matt read that this combination produced a better quality of meat… I guess only time will tell. We hope to incubate some eggs in about a fortnight, so I’ll keep you up to date. But at the moment, Ronnie seems a little overwhelmed by the whole experience. And has already been challenged and chased by the Turkey. 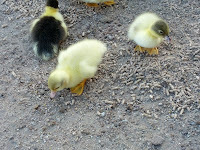 As for our other little ones, the ducklings are becoming increasing confident and cheeky. Raiding the Indian Game chicks food daily; though they are having more difficulties escaping in a hurry, as they no longer fit through the mess that well. The Indian Game chicks themselves, are looking good. We think we have finally sexed them; believing we have 4 boys and 5 girls. The defining factor being that some have begun to develop the blue, green and purple sheens and flecks in the feathers and others have not. As with most birds, the males are more flamboyant. It shouldn’t be too long til their crowing, so guess we’ll know for sure soon enough. Is strange though, as there has been little differences between the males and females, not even comb or tail feathers. The only other characteristic we have picked out so far has been possible leg thickness (boys being thicker) but really this would vary bird to bird anyway. Hopefully he will provide a good cross over our utility layers and it will be very interesting to see the results of him over the Old English Game crosses. Our new residents appear to be settling in well. We herded them into the rear garden (with the general poultry population) and out of the run that they spent their first day in. But are yet to leave them loose around the house. Which is ultimately where we want them. The lady we adopted them off, reported that she had, had her first snake in 11 months (the time she had had them). So I am hoping to progress to having them roam around the whole house yard, as I want them to keep the snakes away. But for now, they appear to be adjusting well and have made no attempts to fly away. Over the past few days, it has taken 2 of us to herd the geese into the run before we have been able to go anywhere. The majority of the flock (even the ducklings), know the drill and happily run ahead of me, when I am carrying a food bucket. Whilst the geese were interested, curiosity would only lead them so far. They fell short of walking willingly into he run. As I was on my own this morning, I had expected this to be quite difficult and to be running around. But fortunately they just wandered in after the other birds; asserting their dominance over their share of the food. They eat together taking it in turns to watch and defend. 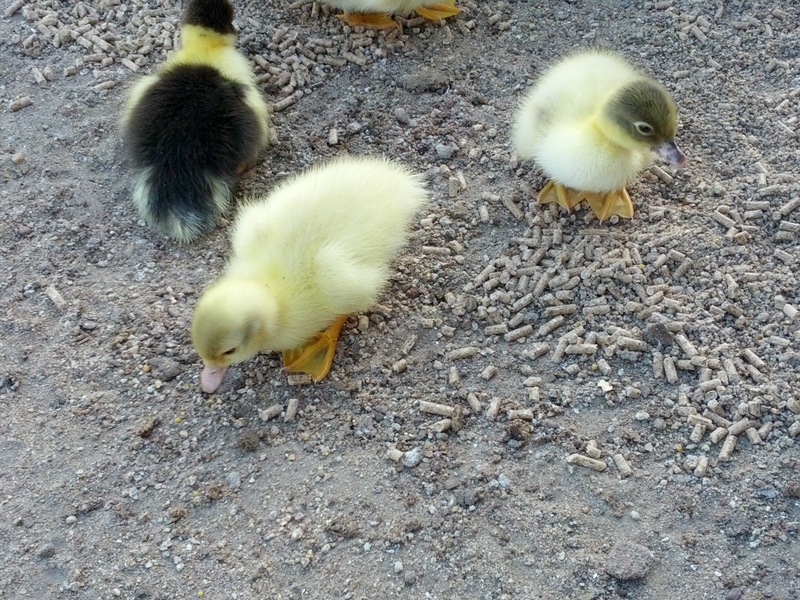 Only the ducks (or more so the ducklings) are allowed anywhere near.